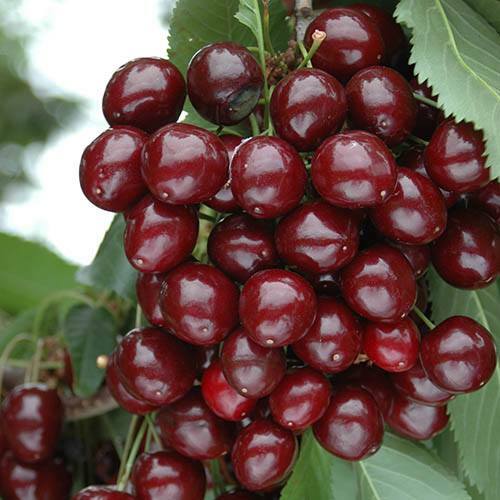 This is simply a completely new way to grow cherries, one which were it not for the persistence of an enthusiastic breeder may never have seen the light of day. It is simply the first bush cherry, as opposed to a tree, so forms a nice neat clump of many many fruiting branches right from the base - and as a result does not get too tall, and makes picking really easy - as well as netting from pesky birds. It still has fabulous sweet flavour to rival market leading 'Stella', it yields well, and is 100% self-fertile, and has the iconic spring cherry blossom too - so makes the perfect garden cherry. If pruned hard each summer, it can be kept very compact, and can even produce big crops of fruit.